The development of flatfoot deformity in the adult is often the result of a rupture of the tibialis posterior tendon. Usually when this happens the foot will become progressively more deformed over time. Pain and swelling are often noticed on the inside of the foot and ankle. Although treatment with special shoes, orthotic arch supports or a brace may be temporarily successful, many patients eventually require surgery. The surgery may involve reconstruction of the tibialis posterior tendon with an adjacent tendon. Frequently this is combined with a surgery on the heel bone or possibly with a fusion of selected joints of the hindfoot in order to straighten the foot. Preoperative photograph taken from behind of a patient with severe tibialis posterior tendon dysfunction and arthritis of the joints below the ankle joint. 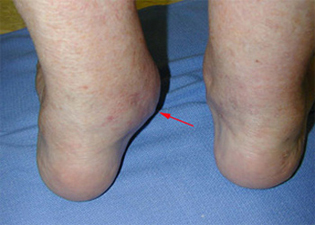 Note that the bulging deformity of the inside of the foot at the site of the break in the arch of the foot (see arrow). 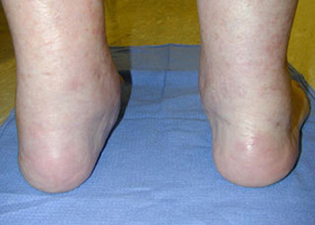 Post-operative photograph taken from behind of the same foot following a triple arthrodesis which has corrected the deformity of the foot. 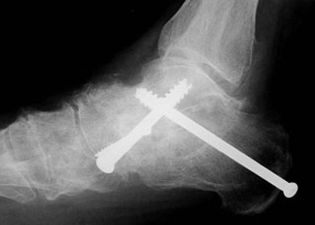 Post-operative x-ray of the foot following triple arthrodesis (fusion). Three screws have been used to hold the bones together while the fusion site heals. 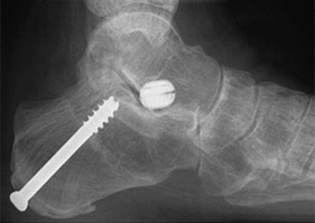 Postoperative X-Ray showing an osteotomy of the heel bone to realign it. This surgery ensures proper of the ankle and heel. Along with the heel bone osteotomy, a tendon transfer is performed to replace the worn out Tibialis posterior tendon. 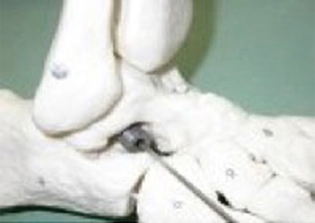 To maintain correct alignment while the tendon transfer heals, a special plug (arthroereisis plug) is used. 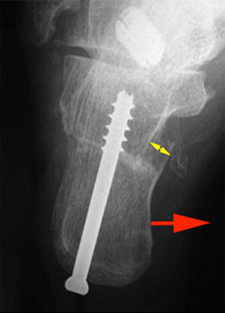 The plug is evident on this X-ray as the round white structure.